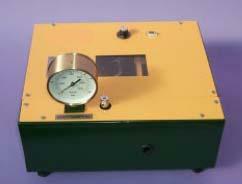 Bench-top, to determine radial and hoop stress distribution of internally pressurised cylinder. Aluminium alloy cylinder with 12 strain gauges fixed through the wall and wired to a selector switch. Hand operated hydraulic pump with stop valve and pressure gauge reading to 100 bar, working at 70 bar.